The program, which serves seven out of 10 4-year-olds in Tulsa, has attracted lots of national attention over the years because of the on-going debate over the benefits of preschool and whether those benefits are long-lasting. William Gormley, a professor of public policy at Georgetown and one of the lead researchers, says the Tulsa findings offer convincing and compelling evidence that they are. Why is this study a big deal? Because it's the first long-term study of a universal pre-K program that shows how kids benefit. Middle school students who were in pre-K years earlier have higher math test scores, are more likely to enroll in honors courses, and are noticeably less likely to have been retained in grade. We hypothesize that a key reason for this is that elementary and middle school teachers have ratcheted up the academic rigor and quality of instruction because these kids were much better prepared [compared to students who weren't enrolled in preschool]. Classroom instruction then becomes more stimulating and beneficial to students. Teachers tell us they can spot a pre-K alumnus a mile away because that child is better prepared to learn. What exactly did you measure? We decided to look at a wide range of potential outcomes that the school district had good data on, deep into the middle school years. They included standardized test scores, letter grades, attendance, special education placement, whether students were in honors courses or gifted programs, suspension and retention rates. 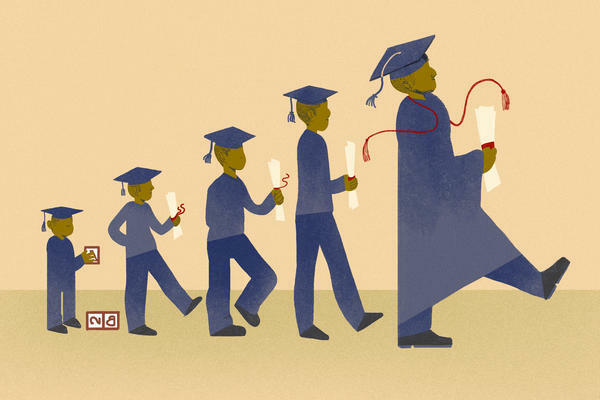 In earlier findings, the kids in your study were also more likely to be engaged in class, less timid, more confident, with one glaring exception: black boys. By middle school, they're not doing as well as their white or Latino peers. The results for African-American kids are not as promising in the long term as the results for members of other ethnic and racial groups. Other research, including studies of Head Start, reached similar conclusions. But one big important finding for all kids in Tulsa's pre-K program, including black students, is that they were less likely to be retained in grade. That's a really big, important finding because retention is closely associated with negative outcomes like weak academic performance, dropping out of school, higher crime rates, and lower earnings later in life. Still, Hispanic kids do benefit more in the longer run compared to black children. For example, the principal beneficiaries of pre-K were English language learners. Their reading gains, in particular, were phenomenal after only nine months of being in Tulsa's pre-K program. You say that one major factor in kids' overall success is that the Tulsa program is of really "high quality." How do you define high quality? There are two different ways to measure pre-K quality. The first way is to focus on the education level [of preschool teachers] and student-teacher ratios in the classroom. Those things look very good in the Tulsa program. Every teacher has at least a bachelors degree and is early childhood-certified. They get paid the same as a regular [elementary school] teacher. But the proof in the pudding is to see what's going on inside classrooms. In Tulsa, the legal requirement is that you have one teacher for every 10 students in the classroom. We estimate that the cost of full-day pre-K in Tulsa is $10,000 per student. The latest data shows that the long-term benefits of the Tulsa program exceed the short-term costs by at least two to one in current dollars. In other words, taxpayers should be reassured that their investment in universal pre-K is paying off. But can a high-quality program somehow "inoculate" children from academic failure? A lot of students, especially disadvantaged students, suffer from low self-esteem. They do not think of themselves as being successful. That's when a high-quality pre-K can be enormously important. We don't necessarily know what's going on inside children's heads to account for their success. We don't know what's going on inside individual elementary and middle school classrooms that help sustain these successes. What we do know is that Tulsa's pre-K program is producing lasting dividends for students down the road. Is Oklahoma's universal preschool program a model for the nation? Yes, because Oklahoma has demonstrated a very strong commitment to pre-K over two decades. It has enormous public support so it would be hard to terminate it because ordinary folks know the program is doing wonderful things for their kids. Will your findings from Tulsa change the national debate about the long-term benefits of preschool, both real and perceived? There's been enormous interest in the Tulsa pre-K program for the past decade. That's because it was adopted by a very poor state, a rather conservative state and it continues to produce positive outcomes for kids. The Tulsa findings highlight the importance of quality, the importance of recruiting and retaining really good teachers. They've been trained extremely well. They've been allowed to devote more time to literacy, math and science. Whether that will continue is uncertain because the state of Oklahoma has [recently] chosen to underfund K-12 education and that's regrettable. It means that unless Oklahoma chooses to invest more in education, some of these significant gains will dissipate. As for our research, our next study will look at the impact of Tulsa's preschool program on high school students' performance.